I have a rice cooker the size of a Mini Cooper. My mom got it for me. It's a rule that Koreans must have rice cookers, but I just don't eat that much rice. My mom must have forgotten that she gave me another rice cooker 15 years ago and it's in storage with other things we don't use: my husband's guitar, his snowboard and my business school notes. When my mom gave me the rice cooker this time, shortly after Greyson was born, I decided to make use of it. I thought I could use it as a slow cooker, but nope...the thing can cook rice in 50 ways, but it can't slow cook. Today I tried oatmeal, which I always burn because I'm doing other things while it simmers on the stove. Bam, it worked. I had just tossed some oatmeal in the Mini Cooper this morning and 20 minutes later, Greyson had perfect oatmeal. Life changer! If you have a rice cooker or any random appliance you don't use enough, it could have time-saving potential. Check it out! If it's taking up space in your home, you might as well try to use it, right? I know there's a whole universe of people who like to make all sorts of dishes in their rice cookers, but I don't want to do the work of looking up recipes to make specifically in the rice cooker. I just liked that the rice cooker made something I wanted to do anyway (make oatmeal) way easier! Another life changer for me this week was using the dishwasher daily. It makes me feel like I'm saving lots of time. I don't know if I'm in the minority here, but I've never been in the habit of using a dishwasher. Could it be a New York thing? An apartment that I lived in for 10 years in Manhattan didn't have a dishwasher, but even when I did have one, I never seemed to have enough dishes as a single to fill the dishwasher quickly enough (before everything crusted on the plates forever). My new thing is running the dishwasher daily because that's the only way it works for me. Otherwise, I need something that's in the dishwasher from yesterday that's dirty and I wash that and then I'm back to, why didn't I just handwash this stuff? 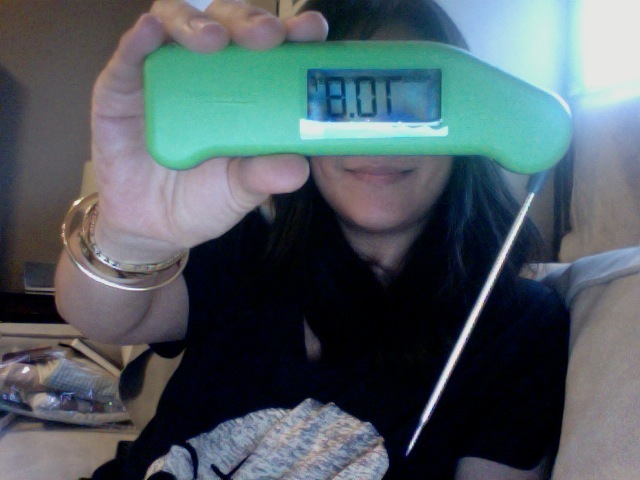 And the final little life changer is my Thermapen, which Rob got for me. It's an instant-read thermometer that has taken much of the guesswork out of cooking meats for me. I've also used the Thermapen when I needed to add a certain temperature of water in my baking, that sort of thing. I could see using it to make sure that Greyson's food isn't too hot in microwaved spots instead of poking my finger and dragging it around in all of his food at each meal. Totally worth the $89. I will give Greyson one of these when he lives by himself one day.